Home › Kids › Out running with my buddies. Out running with my buddies. So, after a day of rest, I headed out for an evening run. Now I had been on the fence on whether two days of rest would be a better idea (I was still very tired/sore from my training less run), but really wanted to be out in that beautiful weather. That, combined with the worry of building non running momentum (it’s so easy to not run on the third day…) I decided it was a definite running day. I gathered up my sidekicks….and then stopped. See, my sidekicks were going to ride their bikes and keep me company. Well, it seems that boy-child’s bike kept popping the chain off! Well, some quick surgery on the bike and THEN we were off! Notice how well attached the bike chain is on the silver bike? It was a beautiful 81 degrees and sunny! I had mapped out a nice easy (only one turn) route with wide sidewalks so I knew the kids had plenty of room. It seems that everyone and their brother also realized how beautiful it was! 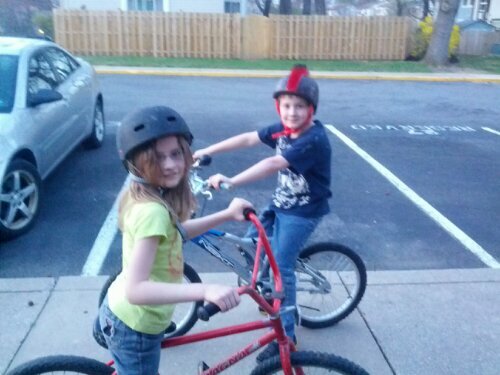 My kids did a fantastic job of dodging people/walkers/runners/dogs while staying with me on their bikes. Also, neither of them ran into me – which I consider an important success! I am definitely not used to breathing hot air – and no that is NOT A complaint! Just a statement that I need to let my body adjust and get used to it! The legs were definitely whining to me about being out there – they were tired and just wanted to put their feet up. They may have mentioned something about Mai Tai’s too, but I’m not sure.. I couldn’t hear them clearly over my heavy and tired breathing. The pace was good (8:34), though Daily Mile put it at 7:30ish as it added another 1/2 mile to the distance when I uploaded it. 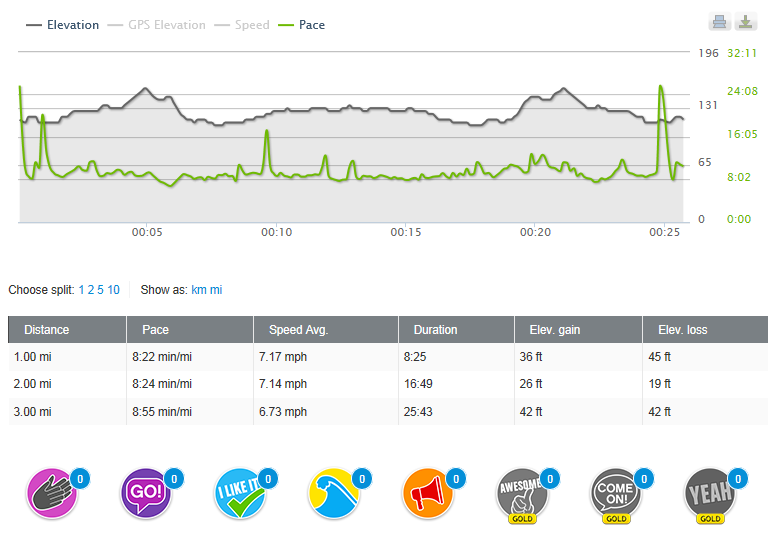 I assure you, I did not run a 7:30 pace for 3 miles… I know I didn’t, because I’m not dead. This morning, I can definitely feel my legs continuing their quiet whining – but its not to bad. I had debated getting up at 5 for another 3 miles, but changed my mind. I think walking around today will help to loosen everything up, which will make tonight’s run easier than a morning run would have been. Plus, my kids enjoy the bike ride! That third mile was a wee bit slower – because my daughter (the social butterfly) had to chat with one of her friends at a playground we passed. You notice there isn’t much in the way of elevation change here – it seems this part of Maryland doesn’t have any hills! I am going to have to figure out somewhere I can go to get hill workouts in. 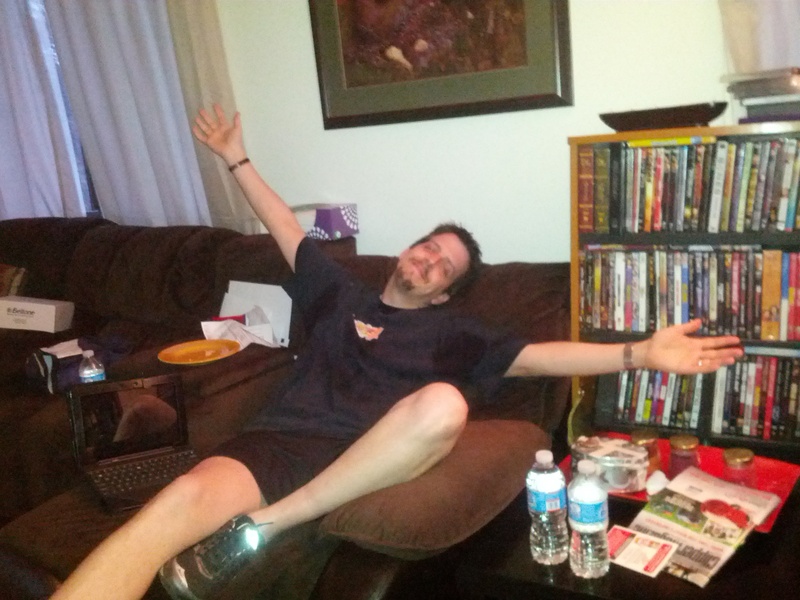 And at the end – my legs finally got their wish as I collapsed onto the couch (after stretching, I assure you) to drink water and rest/rehydrate!